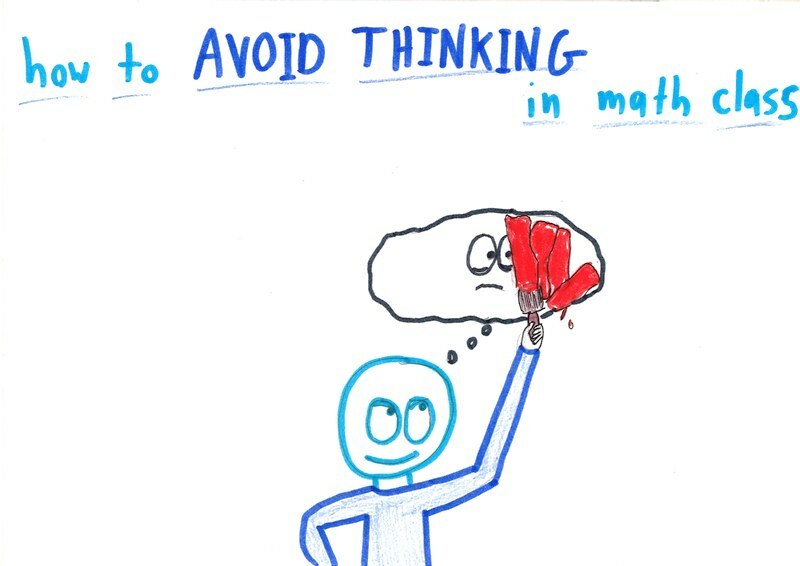 This September, I gave my 7th-graders an elegant little problem about a 12-step staircase. You’re climbing from the bottom to the top, using combinations of single and double steps. The question is, how many ways can you do this? 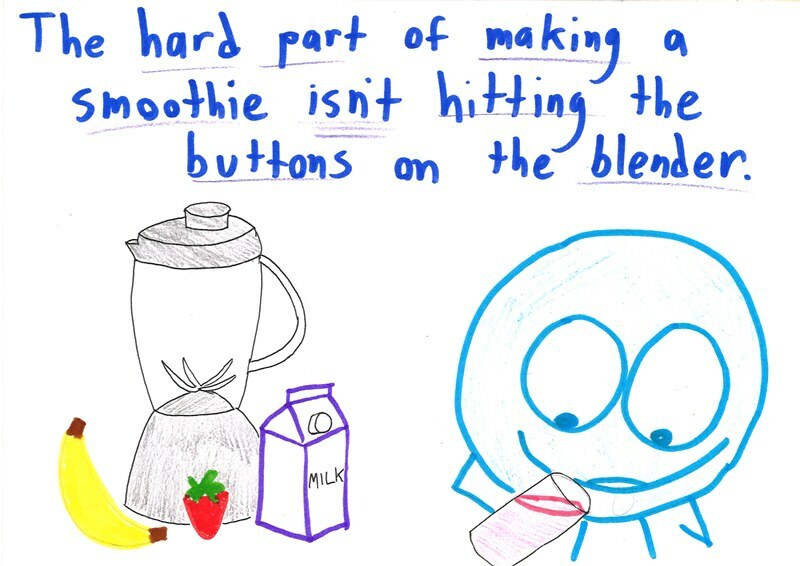 To him, at that moment, “doing math” meant “making a number smoothie.” You take the numbers in front of you, throw them all into the blender, and mash the “pulse” button until you get something. The funny thing is, in our classes, this often works. You see a thick block of text; you pick out the numbers; you run them through the formula; and voila, you’ve got a solution, no thinking required! Maybe you can. Or maybe you’ll conjure up a foul paprika pasta paste. The number smoothie is a classic way to avoid thinking. It is the blind mashing of a button. 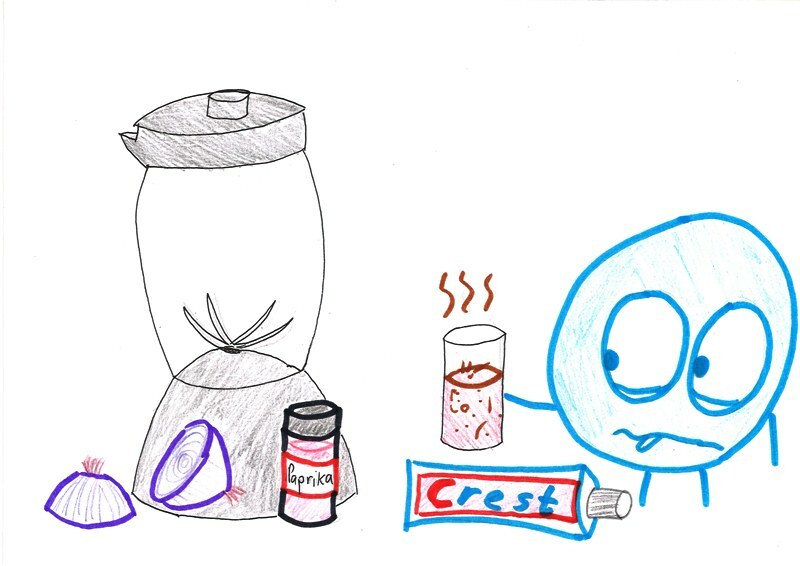 Whereas real mathematics is thoughtful, selective, and carefully considered, the number smoothie is precisely the opposite: indiscriminate, wanton, thoughtless. It doesn’t mean you should never use formulas, any more than you should swear off smoothies. I’ve written before about the need to understand where formulas come from, but even after you’ve done that, a formula needn’t be a lifeless tool. 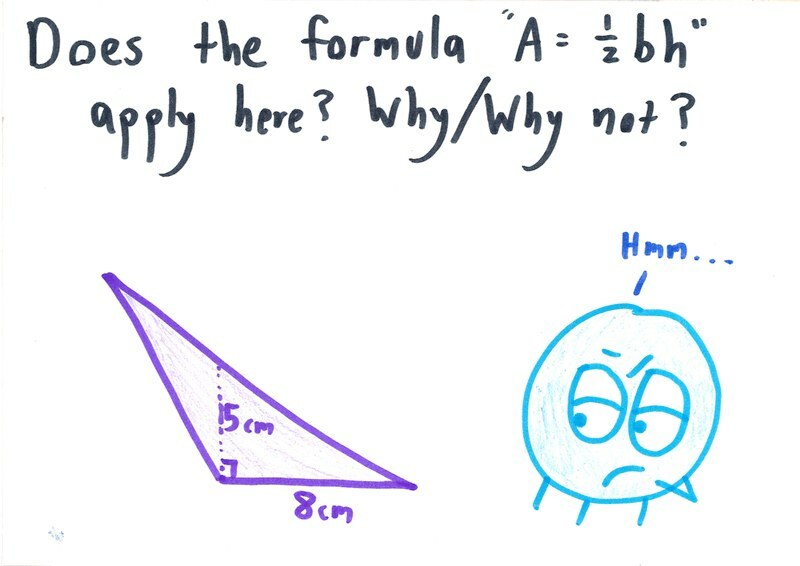 Learning a formula doesn’t need to be the terminus of thought. 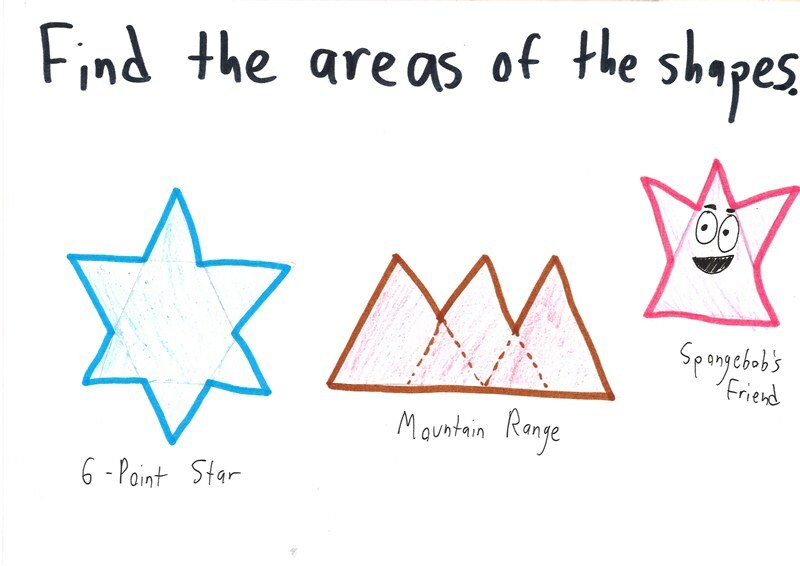 For the blue, pink, and purple triangles, you’ve got too much information. It’s the mathematical equivalent of needing to sort out the onions and toothpaste from the real ingredients. 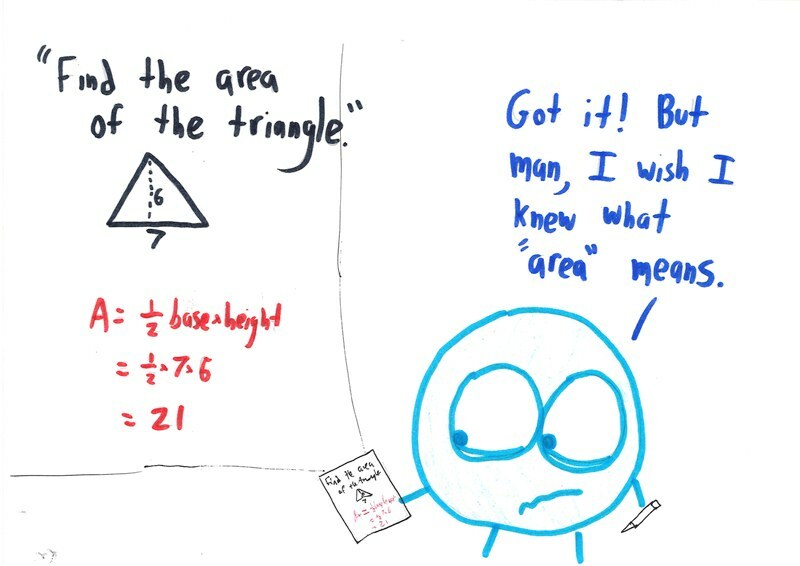 For the green, you don’t have enough information—the mathematical equivalent of needing to root through the fridge to find the missing strawberries. Now, there are no ingredients at all! You’ve got to go grocery shopping all by yourself. 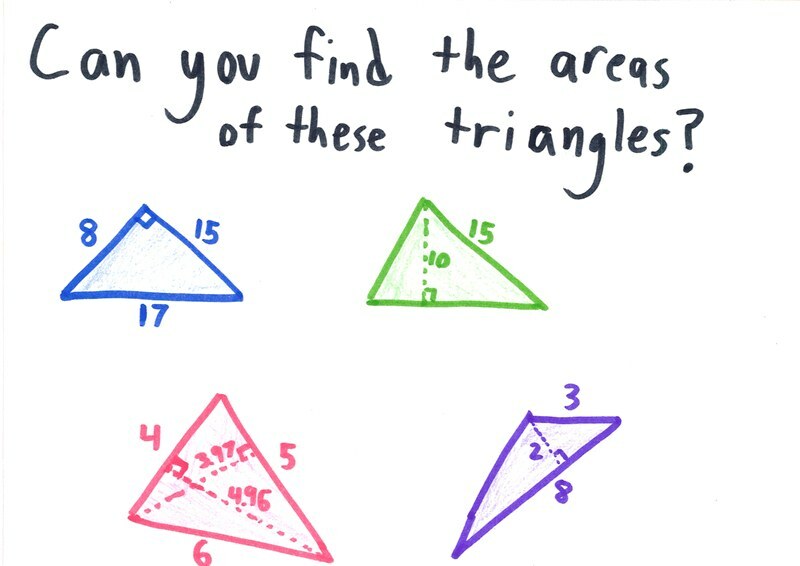 It’s a newfound freedom (and, for many students, a new level of cognitive challenge). Whereas before you just blended yourself a puree and called it quits, these questions demand a more sophisticated kind of cooking. Now, using the formula is just one small step along the path. You’ve been given an ingredient that looks like a strawberry, but isn’t. You’d better know your stuff if you want to recognize this poisonous imposter-berry before it’s too late. Of course, that’s going too far. The intelligent use of formulas is an important part of mathematics. But we’re right about one thing: there’s a lot more to formulas than just throwing numbers into a blender. Next Post Are You a Dish-Washing Robot? I used to do that a lot! But the answers never came out right. Wonder what must have gone wrong!!! Well… I just got well and truly nerd-sniped. This is amazing. You never actually say if your student’s answer is right or wrong but I think it’s wrong. I can vary a) the number of doubles I take and b) where I put them. Suppose I take one double. I take 11 step actions overall. Now i can either try and work out how many ways i can fit one double step between 10 singles (11) or I can say I have 11 actions total of which one is different, and find how how many ways I can arrange them (also 11. Of course). I chose the first way of looking at it, but had a terrible time trying to generalise my counting for other scenarios. The second way of looking at it makes you realise that its just a plain old Choose function which there is an easy evilformula for. (I did try to derive that formula from first principals, but failed, and the lure of Google was too strong). So, if i take one double, it’s 11C1 which is 11. If it take two doubles, that leaves me with 8 single steps for a total of 10 actions in total. 10C2 is 45. I carry on for if i take 3 doubles (9C3), 4, 5 and 6 doubles, and sum all of the combination calculations. I get 233. What if I vary the total number of steps. Is there a general solution? Reworking the above thinking for smaller staircases and you get 2 steps (two possibilities) 3 steps (3), 4 steps (5), 5 (8), 6 (13), 7 (21) and OH MY GOD ITS THE FIBONACCI SEQUENCE! Generalising – for n steps, the answer is the (n-1)th Fibonacci number. This seems so right, and so natural, and yet I cant work out why, and i cant prove it. this took me a while ! Great problem, isn’t it? Got it from a colleague. (A) You can climb N – 2 steps, then finish with a double. (B) You can climb N – 1 steps, then finish with a single. 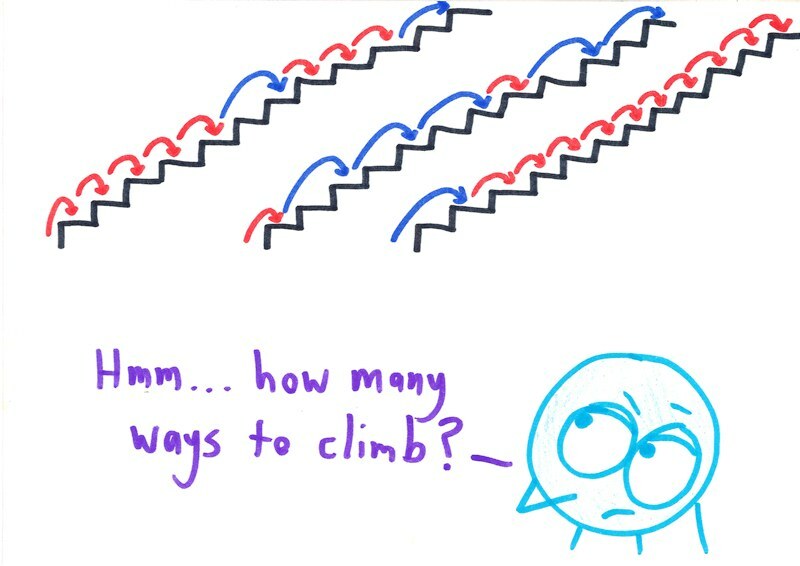 In other words, the number of ways to climb N steps is the number of ways to climb N – 2, plus the number of ways to climb N – 1. It is indeed a great problem. Thanks so much for your responses Ben and Howard. 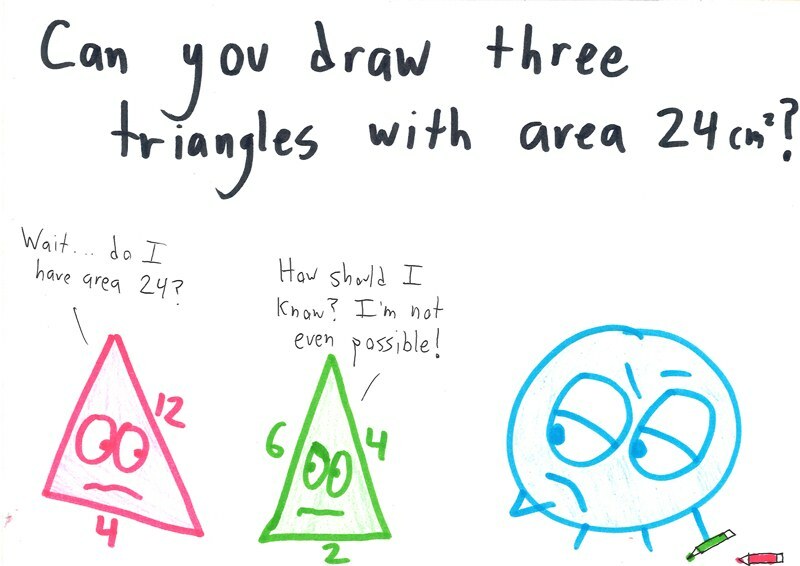 Makes complete sense to me now and – as is so often the case with maths – I dont know why I didn’t see it before. I think that’s given me a few useful angles to think about on the version of the problem where you can jump more than 2 steps. We shall see. Btw – I had read the playlist post. It was magnificent. Please do keep writing. Combining the long way and the short way of doing this problem, we learn that if you sum a diagonal array of Pascal’s triangle (moving like a knight: up 1, over 2, or rather 1.5 since it’s a triangular grid) starting at the edge of row N, you get the Nth Fibonacci number (or N+-1th depending on how you’re counting). I wasn’t expecting to connect those two concepts today. I worry that it’s self-referential too, as a formula. I’m getting an Escher-like feeling when I try to think about it. Ah, another benefit of banishing the smoothie! It doesn’t take the students long to figure out that the typical word problem is a window dressed piece of arithmetic, so of course they don’t read the words. I think that the term “word problem” should be banned. Three ships leave at the same time from Boston to New York. The first ship takes 11 hours, the second ship takes 13 hours, and the third ship takes 14 hours. How long does it take for all three ships to arrive? Joshua, shouldn’t there be stipulations about whether those are African or European ships and whether they’re laden or unladen? I can recall several incidents, all of which indicate the teachers’ focus on “how” rather than on “why.” What can we expect when test scores are the measure of success, and the tests consist of formulas pretending to be questions? That may be the norm, but there are great teachers sharing their wisdom over the web via posts like this. I am really thankful for the difference they are making in so many lives. This advice is completely applicable to my university philosophy class. Just substitute ‘words’ for ‘formulas’ or ‘numbers’. Critically analytical and hopefully and funny. One must ensure that students can analyse problem. Formula and tips can come later. Once we understand problem in math or other subjects and know the approach, we appreciate formula and sometimes when one forget the formula once can deduce it.